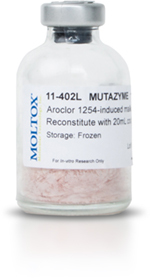 MUTAZYME™ consists of PB/BNF or Aroclor induced Sprague Dawley (SD) rat liver S9 that has been lyophilized with NADP, D-Glucose-6-phosphate, MgCl2/KCl in pH7.4 Sodium phosphate buffer. After reconstitution the resultant S9 Mix may be directly used in standard plate incorporation assays or liquid fluctuation tests. MUTAZYME™ 30% was specifically developed for use in microtiter fluctuation tests e.g. Moltox FT™ 471, Moltox FT™ E. coli, Moltox FT™ TA98/ TA100 and Ames II™. MUTAZYME™ 5% and 10% S9 Mix may be directly used in standard plate incorporation assays.